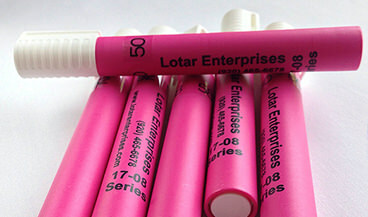 We carry non-poison PINK pens and inks and BLUE formamide mixture pens of defined surface tensions for wettability and metal cleanliness testing. They identify the necessity of corona, plasma or gas flame treatments or cleaning processes in planned production lines, or its testing of quality in existing lines. 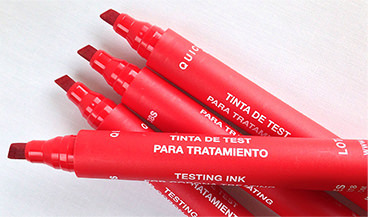 Our bright RED Quicktest pen 38S (16-3801), non-poison PINK pens and inks (17-08xx and 18-08xx Series) or regular BLUE formamide-mixture pens and inks (17-05xx and 17-07xx Series) are available. 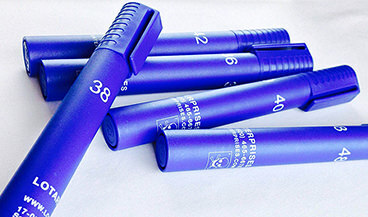 All of these pens and inks are proven to set the standards for surface tension testing in the plastics and metal industries. Surface energy is one decisive criterion for the adhesion of printing ink, glue, varnish, etc. on many plastic and metal surfaces. It is given in mN/m (milliNewton per meter, currently valid unit) or in dyne/cm (dyne per centimeter, old unit, same numerical value). Apart from some exceptions the general rule is: The higher the surface energy of a material, the better is the adhesion of anything meant to be fixed to its surface.